Wayki Wayki Blog: Flat Earth, Galactic Centre, and Ancient Myth. One needs to read Part 1 and Part 2 before this article, or it won't make much sense or hold up. I'm sorry, it's just the way it is. One can even sprinkle on a Part 3 topping if one so desires. It should be noted here that this is a theory......one I call The Great Shifty Rifty Myth Theory. I have a cauldron blending information and ancient myth which has been stirred on high heat, and you are about to be served a rather large dinner. The flat earth model enables one to re-look with new eyes at ancient cataclysm, myth, and warning. 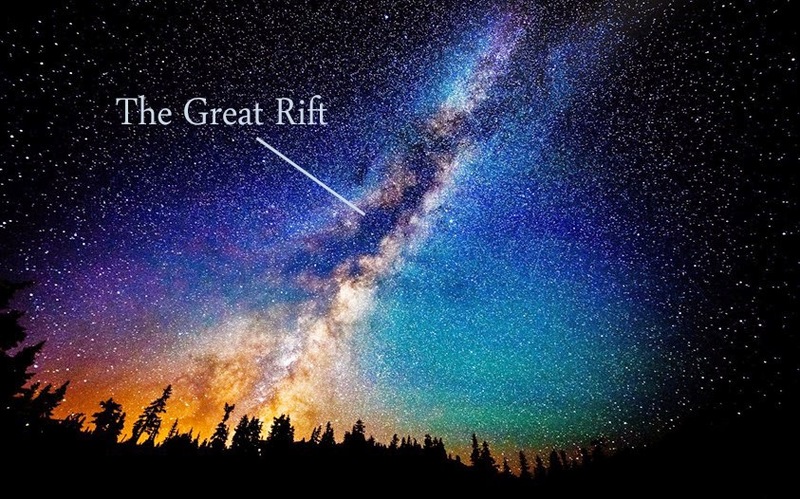 We no longer see the "Great Rift" (also known as the Dark Rift) as being in the "galactic centre" from our new stance, we now see it as being a kind of tear in the celestial dome that spins around our disk. This is because the stars are now all "spherical earth sky" because the theory of being at the edge of the galaxy has been quashed. We are at the centre of things within the flat earth model. Other flat earth dudes (all 20 or so? 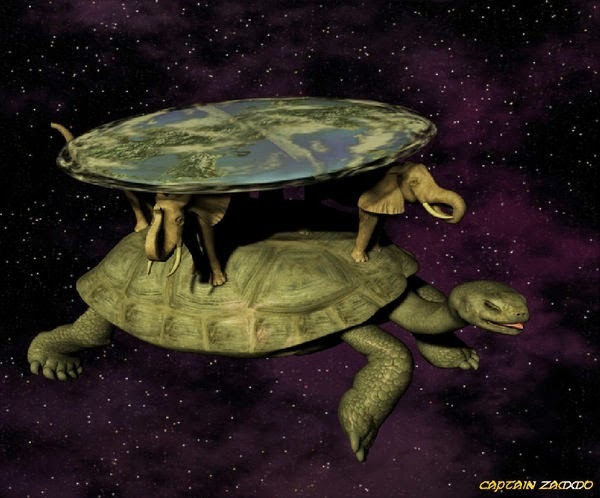 heheh) have not done the research into ancient myth, and the ancient myth dudes strangely laugh at the flat earth model, so we are pretty much in brand new territory - seeing things with new eyes. 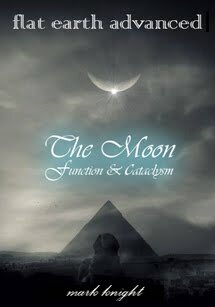 So, most of us know there were ancient cataclysms; the flood story is rife through all traditions, and it's generally believed that the last cataclysm was sometime between 9,000bc and 13,500bc. One could even ask themself why the oldest living tree on earth is only 5,000 years old. Also many looking at the geological strata (the top layers of the surface of the earth) say they are only a few thousand years old. But that is all for another time, we have much to cover. 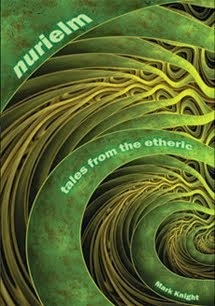 So which myths of cataclysm, warning, and creation, talk of Galactic Centre, and/or the Dark Rift? The area that sagitarres' bow, and Scorpions poison tail both point towards! If we look up at the Dark Rift, without any conditioning from NASA or the Government (e.g educational bodies) - we see it simply blocks out our view of a bulge (egg, celestial ball, call it what you like) in the nights sky. Look at this for a while, see into it, forget labels. Note that the word Rift means a crack, split, or break in something. It does not mean "cloud of giant stars trillions of miles away." "One dark and moonless night, while birds, wild beasts and cattle slept, Piran in dream beheld a splendour that outshone the sun itself." And leafage of the trees, a storm of snow will shower down from havens’s louring rack …"
The Babylonian myths of Eridu consider its location at the “crossing of the rivers” - often relating to the great rift in ancient lore. In other lore from this area, many scholars believe Marduk's star is Jupiter, and others see it as Galactic Centre. 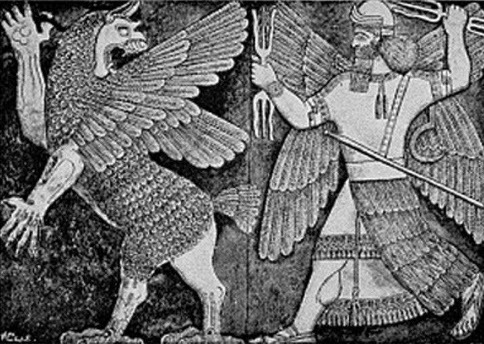 It is reasonable to propose that Marduk/Ninurta was depicted as the Sagittarius constellation shooting his bow or weapon of choice towards the Great Rift, and hence slaying the Abzu/Tiamat creature in this location. The Babylonian Tiamat was known as a fierce demoness whom Marduk was supposed to slay with the Sharur, but she is also clearly associated to the Milky Way by being “married” to the primordial waters of the Abzu and giving birth to all the “Gods” (i.e. stars and planets) of the heavenly ocean. composed of many constellations together / the ultimate area of the cosmos. repeated all over the world by various cultures. "An Indian [native] once tied a llama in a good pasture, but the animal would not eat, it just stayed there looking sad and it would complain in it's own manner, always crying “yu,yu”. The shepherd was eating corn while he noticed this, and threw the remaining corn cob and said:Imbecil, why are you complaining instead of enjoying your food? Haven't I brought you to a good pasture. The llama replied: „you fool, what do you know?! You don't even suspect what is going to happen? Know that my sadness has a good reason. For five days the sea will grow and it will cover the whole of the earth, and all that inhabits it will perish. Surprised by the fact that the llama could speak all of a sudden, the man asked if there was no means or any way to be saved. And then the llama told him that he should quickly climb a mountain called Uillcacoto, and that it was placed between St. Damian and St. Jeronimo de Surco; that he should take supplies for five day's worth and that he would then survive." The myth of the talking llama and its shepherd points us once again towards Galactic Center. There is an Incan constellation which depicts a llama called Llamacñawin, and its eyes (Kaura Nayra) are the stars Alpha and Beta Centauri. The Incas depicted the heavenly llama and basically all their constellations as dark bodies which are part of the Dark Rift in the Milky Way. "A month before the flood came, the sheep showed much sadness, watching the stars at night and not eating. Their shepherd asked what bothered them, and they told him that the conjunction of stars foretold the destruction of the world by water. The shepherd and his six children gathered all the food and sheep they could and took them to the top of the very tall mountain. Ancasmarca. As the flood water rose, the mountain rose higher, so its top was never submerged, and the mountain later sank with the water. The six children repopulated the province after the flood. 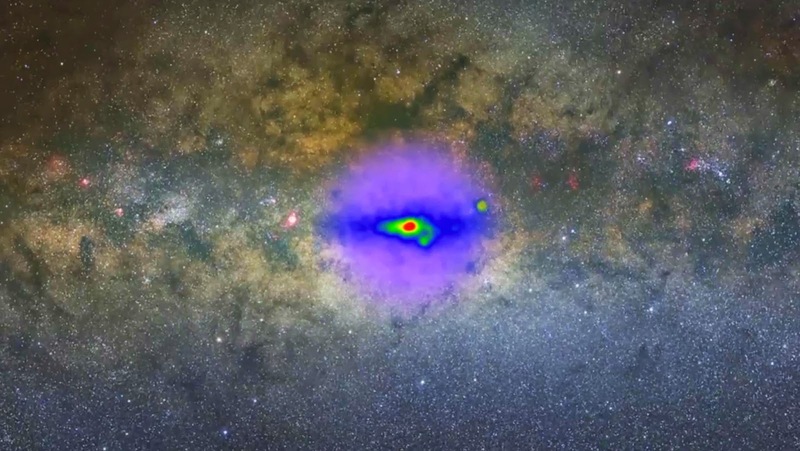 "Radio telescope observations indicate that the Galactic core (Sagittarius A*) has erupted 14 times in the past 6000 years, each time spewing out a cloud of ionised gas (…) about 80 percent of these Galactic core outbursts occurred within 500 years of one another, yet it has been 700 years since the last event." "Mother Nut is changed into a cow and ordered to carry Ra. (It is, by the way a new Ra: the older Ra made it quite clear that he wanted to retire for good, going somewhere „where nobody could reach him)." "Horus has moaned because of his eye; Set has moaned because of his testicles. The eye of Horus sprang up as he fell on yonder side of the Winding Watercourse, to protect itself against (or, free itself from) Set. Thot saw it on yonder side of the Winding Watercourse. The eye of Horus sprang up on yonder side of the Winding Watercourse, and fell upon the wing of Thot on yonder side of the Winding Watercourse." Plutarch mentions that Osiris' body was thrown through a “mouth” of the river, and also mentions that Isis wept at a well. The location of Osiris? 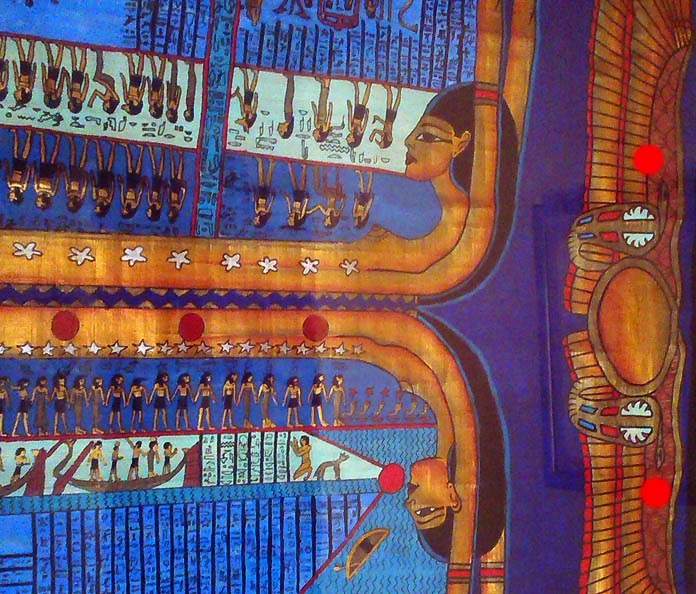 resting place may be found in the fact that the Ancient Egyptians commemorated Osiris? 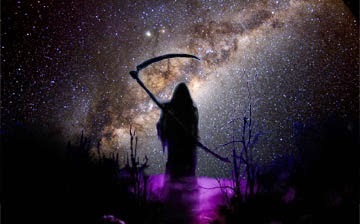 death when the Sun entered the Scorpio constellation and conjoined Galactic Center in the heavens. The image of Seth was sometimes replaced with a serpent named Apep (aka. 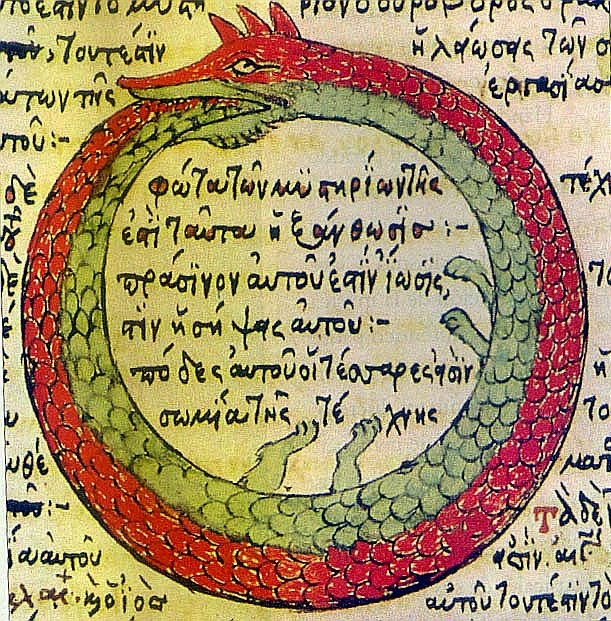 Apophis in Greek). 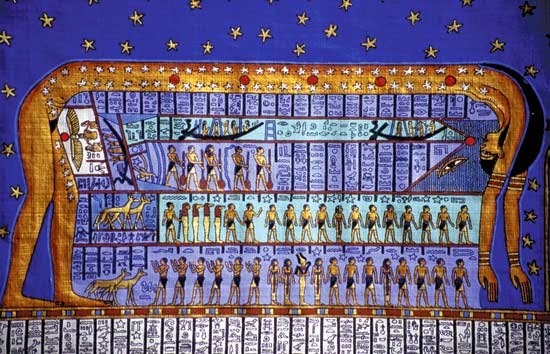 "The Egyptian tells how the movement of bodies in the heavens leads to the destruction of the earth at long intervals and how all knowledge is lost at these times. 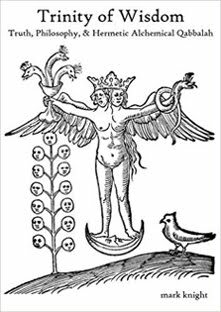 That story, as it is told, has the fashion of a legend, but the truth of it lies in the occurrence of a shift of the bodies in the heavens which move round the earth and a destruction of the things on the earth by fierce fire, which recurs at long intervals. and when, after the usual interval of years, like a plague, the flood from heaven comes sweeping down afresh upon your people, it leaves none of you but the unlettered and the uncultured, so that you become young as ever, with no knowledge of all that happened in old times in this land or in your own Nile." "When blood drops upon the Earth, the Destroyer will appear, and mountains will open up and belch forth fire and ashes. Trees will be destroyed and all living things engulfed. Waters will be swallowed up by the land, and seas will boil." (Note: youtube blood rain). The ancient goddess Nuit is an archetype of the nights sky. She is often depicted as being "held up." 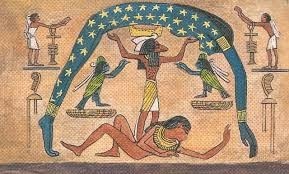 In this ancient depiction, the sun god has wings, and also has two serpents, and it sits behind the stars. Notice the boats too. The Myth of Prometheus and his “fire” reveals a link to Galactic Center because his father, the Titan Iapetus bares a name meaning “piercer”: an analogy to the Scorpio Constellation's stinger piercing our galaxy's nucleus." In Homer's Illiad the Titan Iapetus is mentioned to reside with Kronos in Tartaros leading us once again to the gate of the underworld. "The boundless sea [Heavenly Sea Okeanos] rang terribly around, and the earth crashed loudly: wide Heaven was shaken and groaned, and high Olympus reeled from its foundation under the charge of the undying gods, and a heavy quaking reached dim Tartarus and the deep sound of their feet in the fearful onset and of their hard missiles [or darts]. Then Zeus no longer held back his might; but straight his heart was filled with fury and he showed forth all his strength. From Heaven and from Olympus he came immediately, hurling his lightning: the bolts flew thick and fast from his strong hand together with thunder and lightning, whirling an awesome flame. The life-giving earth crashed around in burning, and the vast wood crackled loud with fire all about. All the land seethed, and Ocean's streams and the unfruitful sea. The hot vapour lapped round the earth born Titans: flame unspeakable rose to the bright upper air: the flashing glare of the thunderstone and lightning blinded their eyes for all that they were strong. Astounding heat seized Chaos: and to see with eyes and to hear the sound with ears it seemed even as if Earth and wide Heaven above came together; for such a mighty crash would have arisen if Earth were being hurled to ruin, and Heaven from on high were hurling her down; so great a crash was there while the gods were meeting together in strife." The Olmec were obsessed with the Dark Rift, and saw it as a mouth, and have many myths of a sky serpent. The Dark Rift has many Mayan mythic identities. It is the Black Road, the Road to the Underworld. A crevice in the branches of the Cosmic Tree (the Milky Way). The mouth of the Cosmic Monster (a jaguar or snake with tree-like features). 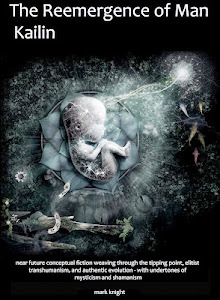 The birth canal of the Cosmic Mother. The Hunab Ku symbolises the source, the cosmic essence of our being. It is the ‘womb of creation’ from which all the stars and planets of our galaxy, including our Solar System, have been created. This is the most sacred symbol for the Highest Authority of the Milky Way galaxy in Maya tradition. The Maize God is reborn from a turtle carapace by his sons the Hero Twins. 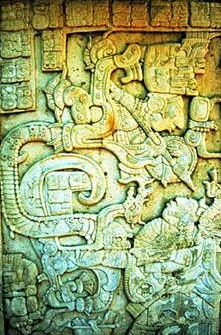 This turtle is the double-headed turtle that cracks open for the rebirth of the Maize God (seen as a serpent below). "I smote the earth and broke it as an egg is broken; for I would cut loose the bound in heaven. Then all the tribes of men cried out: There is a Mazda! An All Power Unseen!" Chich'en Itza is a remarkable place, I have been there on the equinox, and during the fall and spring equinoxes, the sun's shadow forms an enormous snake's body, which lines up with the carved stone snake head at the bottom of the Castillo pyramid. 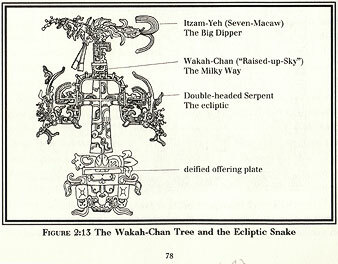 It depicts the return of the serpent sun god. 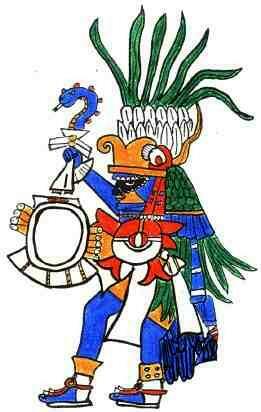 "The Maya name "Chich'en Itza" means “The Mouth of the Well of the Magicians of Water." (Water here could read milky way which was known all over the ancient world as an ocean, or it could mean those magicians that can bring water / deluge). Why goto all this trouble at Chicken Pizza (sorry, Chich'en Itza) unless to send future humanity a message? 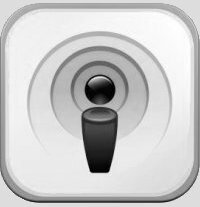 The precision mathematics involved are mind blowing at this site. What? They did this for tourists? For a laugh? To commemorate a theological belief? No, this is something else, if you have been there, and can feel, you would know. The Celestial bird Itzam-Yeh (red) engraved atop the sacred world tree/cross (yellow) on the large stone sarcophagus lid of Pacal in the Temple of Inscriptions. The two-headed Celestial Monster (green). This funnily enough is something I have in clay form - from my own time at Palenque. 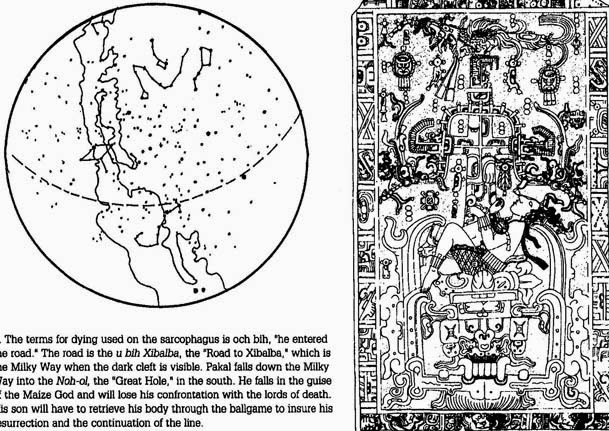 John Major Jenkins had some rubbish theories, but he did speak of ‘the dark rift’, a black ridge along the Milky Way caused by interstellar dust clouds which was known to the ancient Maya as xibalba be. "Xibalba" is the Mayan underworld, "be" is road. The dark rift has been thought of as ‘the Black Road’, the ‘xibalba be’ (the Road to the Underworld). Wikipedia tells us: In Maya mythology Xibalba, roughly translated as "Place of fear." 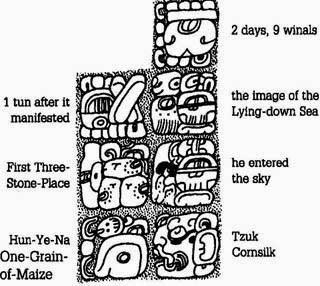 To the Aztecs we are in the 5th sun, and all the others were destroyed by cataclysm, and the one now will perish to earthquakes. Each new sun gives birth to a new world. Sidenote: Different cultures spoke of different disasters like flood, fire, or earthquake because obviously the tangible damage cause was different in localised parts of the world. 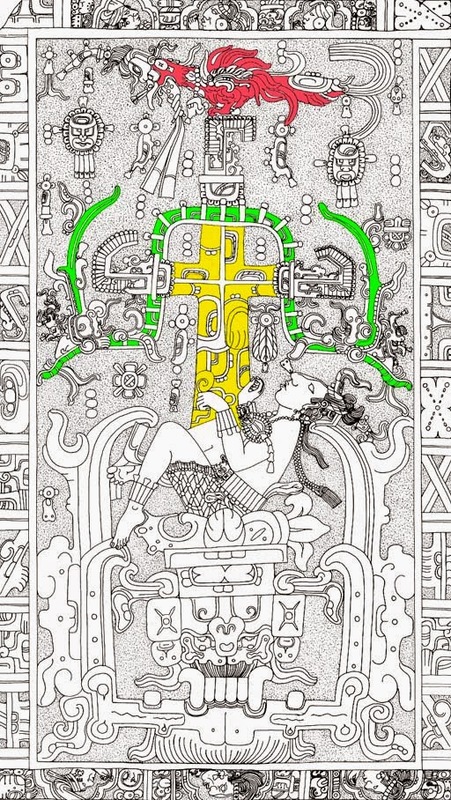 The Aztec's main god was HUITZILOPOCHTLI. It was he who told the Aztecs where to build their city. He was the Sun god who they fed with human sacrifice out of fear. He was the god of war, and holds a serpent. In the Aztec creation story, as the gods continued to create, they had a problem - their creations would fall into the water and be eaten by the dreadful Cipactli. 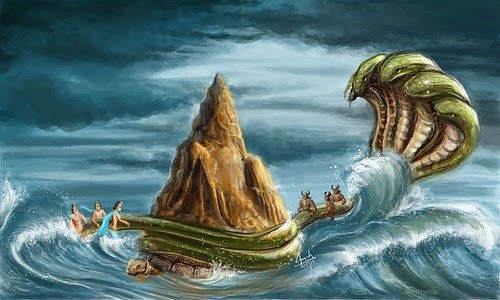 So it was time for war - the four gods attacked the sea monster, pulling her in four directions. She fought back, biting Tezcatlipoca and tearing off his foot. But at last Cipactli was destroyed. From this enormous creature the universe was created. All the 13 heavens stretch into her head. The earth was created in the middle, and her tail reaches down to the underworld (Mictlán) (nine underworlds, to be exact). You could say that in the Aztec creation story the world is on the back of this sea monster, floating in the water of space (reminiscent of the Iroquois belief that the world rests on the back of a turtle). Vedic myth has much about galactic centre.
" …consumeth the waters of the great Ocean, [and which] became like unto a large horse’s head which persons conversant with the Vedas call by the name of Vadavamukha. And emitting itself from that mouth it consumeth the waters of the mighty ocean." "Hirto, Son of Neph, born of an egg, descended out of the highest heaven. He was a most gracious Lord, and in deference to Om, smote against the rocks of heaven. So, when the egg was broken, one-half of the shell ascended, the other half became the foundation of the world." "And out of those two halves he formed heaven and earth, between them the middle sphere, the eight points of the horizon, and the eternal abode of the waters." 1. Aditya (the sun) is Brahman. In the beginning this was non-existent. It became existent, it grew. It turned into an egg. The egg lay for the time of a year. The egg broke open. The two halves were one of silver, the other of gold. 2. The silver one became this earth, the golden one the sky, the thick membrane (of the white) the mountains, the thin membrane (of the yoke) the mist with the clouds, the small veins the rivers, the fluid the sea. 3. And what was born from it that was Aditya, the sun. When he was born shouts of hurrah arose, and all beings arose, and all things which they desired. Therefore whenever the sun rises and sets, shouts of hurrah arise, and all beings arise, and all things which they desire. 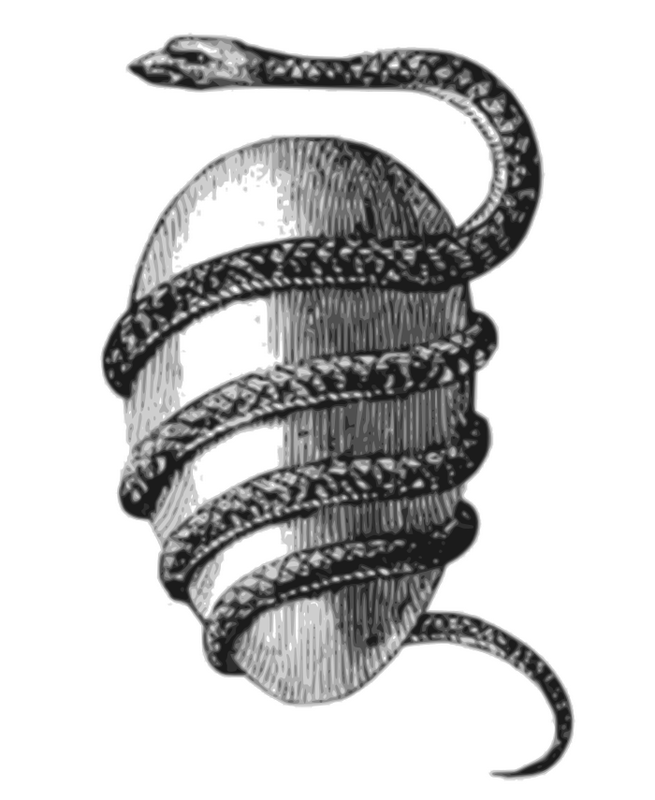 Here it should be noted that there is much cosmic egg theory around the ancient world, and even western occultists and alchemists have used it in many symbols - even placing it with a serpent and a "above the stars." 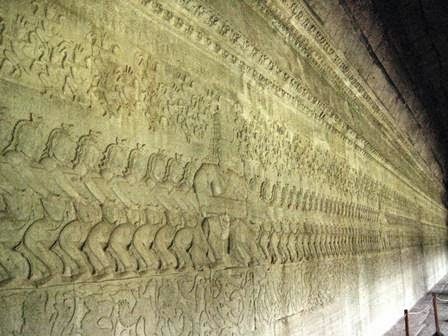 The Churning of the Milky Ocean (Milky Way) is a famous and sacred teaching from the Hindu text the Mahabharata. To churn the ocean they used the Serpent King, Vasuki, for their churning-string. For a churning pole they use Mount Mandara placed on the back of a Great Tortoise - the Kurma Avatar of Vishnu. As the gods and demons churned the sea, a terrible poison issued out of its depths which enveloped the universe. 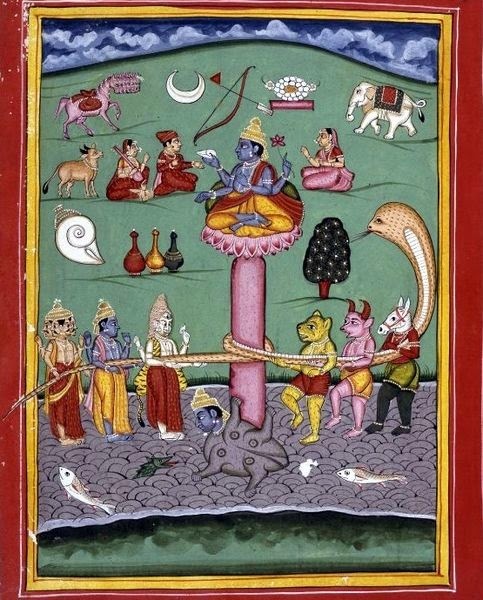 Also there are the Nagas are Vedic myth, about serpents and dragons that live under the ocean, and note that ocean means milky way in so many ancient texts. Worth noting here is that The Purana also points to the association of the cult of Nagas with that of Shiva (the destroyer). a variety of locations ranging from waterways and underground locations and also in unseen realms. They can be often seen on mandalas. The Nagas mythology extends all around the far east, here we see Nagas emerging from the mouth of a Makara (serpent monster) in the style of a Chinese dragon. 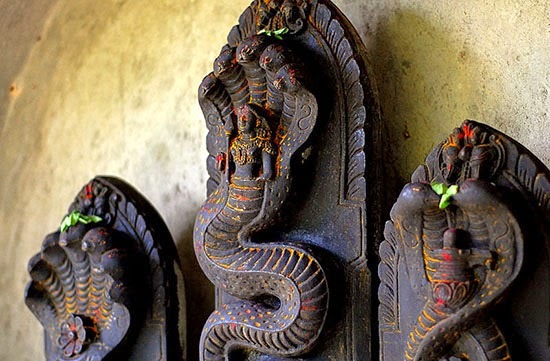 One could write a whole book on the Nagas and their related myth so we will leave them be. 16. During the performance of that renovation of the universe [Frashegird], those holy men and women will come to the help of Soshyant. 17. And as [the dragon] Gochihr within the celestial sphere shall fall from the base of the moon on to the earth, the earth shall have such distress as that of a sheep when a wolf tears off its wool. 18. Then fire and Airyaman Yazad will melt the metal which is within the hills and mountains, and it will remain on this earth like a river. 19. And then they will cause all men to pass into that melted metal, and will make them pure. And the dragon Gochihr will be burnt by that melted metal, [and the metal will flow into the wicked existence, and] the stench and contamination within [the earth,where] the wicked existence was, will be consumed by that metal, and it will become pure. The hollow where through the Evil Spirit had entered is closed with that metal. 32. They will bring that wicked existence of the earth back to the expanse of the world, and there will be renovation [frashegird] in the universe, the world will become immortal at will, up to eternity and eternal progress. 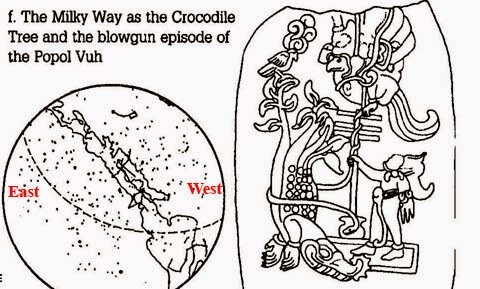 In the Iranian Bundahishn the "targets over the sky" are called the ‘Path of Kayus’ (Milky Way), and the Path of the Dragon Gochihr (the great one of the middle of the sky) is presumably the ecliptic, since the seven planets are the head and tail of Gochihar. 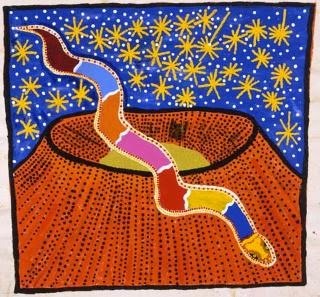 The Rainbow Serpent or Rainbow Snake is a common deity, often a creator god of the Aborigines. The Rainbow Serpent often takes part in transitions from adolescence to adulthood for young men and swallows them to vomit them up later. Likewise, there are several Australian Aboriginal flood stories. One tells how, long ago, there was a flood that covered the mountains so that many of the Nurrumbunguttias, or spirit men and women, were drowned. Others, including Pund-jil, were caught up by a whirlwind into the sky. In their creation story, the vibrant rainbow-coloured scales of the Rainbow Serpent flew up into the bright sky to become a flock of rainbow lorikeet tribe, and the image of her colours was left on the sky as the rainbow (milky way), the reminder to all the tribes of their common mother. The Kaurna Aboriginal People of the Adelaide Plains in South Australia see the band of the Milky Way as a river in the skyworld. In addition, the dark patches are where a dangerous creature known as a yura lives. The legend of Nvwa Mending the Sky is one of the most representative myths about the world creation in ancient China. Legend has it that in remote antiquity, the four pillars supporting the sky suddenly broke and as a result, the sky had chasms and couldn't fully cover the earth. The land on earth also spilt open and couldn't sustain things on top of it. At that time, raging flames ripped through the earth, where torrential flood water, ferocious beasts and birds also wrecked havoc on people's lives. Seeing that human beings were suffering such disasters, Nvwa tried everything she could to mend the sky. She selected all types of five-coloured stones, melted them into slurry over fire and filled the chasms with the slurry. 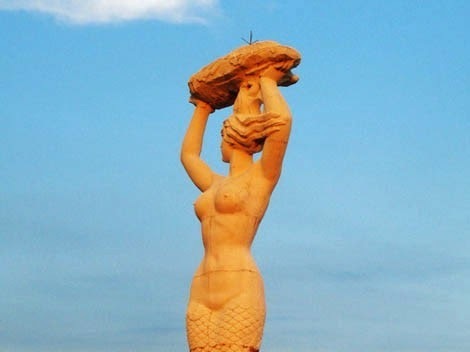 Later, she cut off the feet of a big turtle to prop up the sky. Afterwards, she killed the black dragon that caused floods and other disasters and the ferocious beasts and birds harming people. At last, she burnt reeds into ashes and piled them up to block flood water. Thus, disasters were conquered and mankind was saved. There was a fight between the god of water Gonggong and the god of fire Zhurong. When Gonggong lost the fight, he smashed his head against Mount Buzhou out of fury. Since Mount Buzhou was a pillar holding up the sky, the sky began to fall and caused a lot of damage. Because of that, people's lives became miserable. Nüwa was really concerned about her people so she picked out colourful stones in Mount Tiantai and used them to seal the broken sky. In this way peace and happiness returned to mankind. In the African Fiote, the Star Way [Galaxy] is the road for a funeral procession of a huge star which, once,shone brighter from the sky than the Sun. the souls of the dead, and they locate it in the Scorpio constellation. 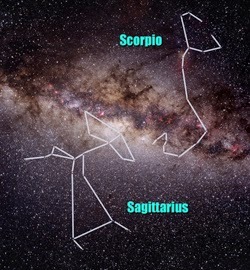 The natives of Nicaragua and Honduras render the same story by speaking of a “Mother Scorpion at the end of the Milky Way” which received the souls of the dead. The milky way is Bifrost and the dome sky is Yggdrasil from the Norse mythology. who eats corpses to sustain itself, bickers with the eagle that houses in the top of the tree. "The Celts may thus have possessed the Heaven and Earth myth, but all trace of it has perished. There are, however, remnants of myths showing how the sky is supported by trees, a mountain, or by pillars. A high mountain near the sources of the Rhone was called "the column of the sun," and was so lofty as to hide the sun from the people of the south. 1 It may have been regarded as supporting the sky, while the sun moved round it. In an old Irish hymn and its gloss, Brigit and Patrick are compared to the two pillars of the world, probably alluding to some old myth of sky or earth resting on pillars. 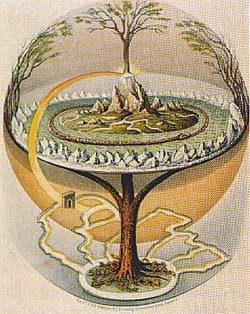 2 Traces of this also exist in folk-belief, as in the accounts of islands resting on four pillars, or as in the legend of the church of Kernitou which rests on four pillars on a congealed sea and which will be submerged when the sea liquefies"
"A fiery dragon will cross the sky Six times before the Earth shall die” Mother Shipton prophecy. "When the sky is rent asunder ; when the stars scatter and the oceans roll together ; when the graves are hurled about ; each soul shall know what it has done and what it has failed to do." Are the beautiful Mosque ceilings trying to tell us something too? Many Gnostics believe Sophia (the earth) fell (was cast out) from Galactic Centre. One of the many meanings in mythology, the Oroborus is a symbol representing the Milky Way galaxy. Myth refers to a serpent of light residing in the heavens. The Milky Way is this serpent, and viewed at galactic central point near Sagittarius, this serpent eats its own tail. Similarly, In Hindu, you have the dragon circling the tortoise which supports the four elephants that carry the world. Note that cataclysm duration cycles of 12,000 years and 26,000 years are all around ancient myth. Other Sun myth can also be looked at with new eyes. Even those strange scientist humanoids are seeing strange things at the dark rift. Don't worry, there is a little more to back this up coming soon below, but now is the right time to explain it. A crack in the vault of the sky opens and the destroyer (a.k.a Nibiru, Tiamat, Adonai, Allah, Typhon, Shiva, Serpent etc) is situated above the so called " milky way bulge." That light we see at the center of the milky way is from this creator/destroyer. A new sun comes out from that place and during this cosmic birth and huge torrents of water fall from the sky. 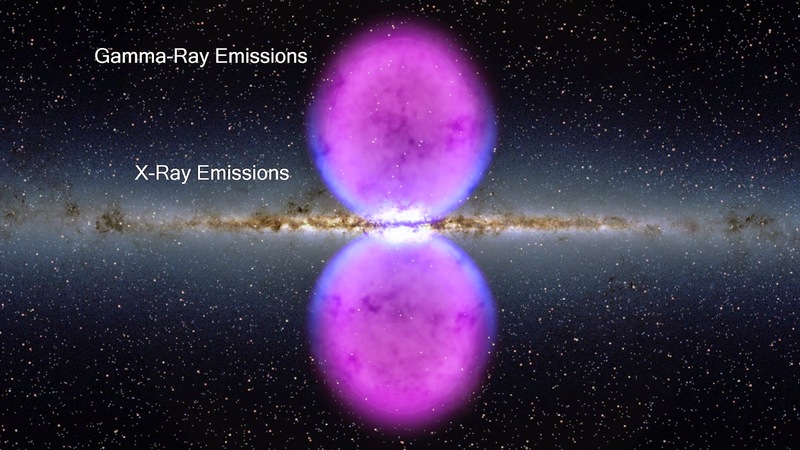 And this thing (this mechanism or etherial being) enters in the crack (the Dark Rift of the milky way) and destroys and resets the earth, and a part of it falls on the earth. And after that the rift closes. Only thousands survive. Now for more support of this theory from the Bible, which let us not forget, is also firmly into the flat earth model. All the stars in the sky will be dissolved and the heavens rolled up like a scroll; all the starry host will fall like withered leaves from the vine, like shrivelled figs from the fig tree. I looked at the mountains, and they were quaking; all the hills were swaying. Take your sickle and reap, because the time to reap has come, for the harvest of the earth is ripe. So he that was seated on the cloud swung his sickle over the earth, and the earth was harvested. Immediately after the distress of those days 'the sun will be darkened, and the moon will not give its light; the stars will fall from the sky, and the heavenly bodies will be shaken. He brings up the mist from the ends of the earth, he opens rifts for the rain and brings the wind out of his storehouses. Lift up your eyes to the heavens, look at the earth beneath; the heavens will vanish like smoke, the earth will wear out like a garment and its inhabitants die like flies. Before them the earth shakes, the heavens tremble, the sun and moon are darkened, and the stars no longer shine. Lord is in his holy temple. Lord, his throne is in heaven. His eyes see and test humankind. (Note the word Lord in the Bible is wrong, swap for the Hebrew Adonai, which means plural of owner or master). 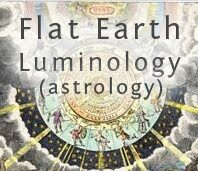 From the heliocentric model nearly all humanoids blindly worship, the ancient myths about galactic centre mean little, but from a flat earth model, it all paints a very different picture. There is an arrogance in today's world about ancient myth, as though they were all primitive fools. The Maya? The Egyptians? The Vedic Rishis? The Persian Mystics? No, in comparison, it is humanity today that are the fools. Step back and think about this - Heliocentrists believe that these myths about the dark rift,are all about something that happened 25,000 light-years away, and affected people on earth; that it bypassed the billions of stars on the way, dodged them all, did nothing to the other planets in our "solar system", and did something to earth. What? Like a laser beam? This type of thinking is pure madness, and you would really need to see someone and get some care. Do you know how far away 25,000 light years is in miles? It is 147,000 trillion miles. You're eyes cannot see that far, sorry, they can't, but so many believe they do....heheh. 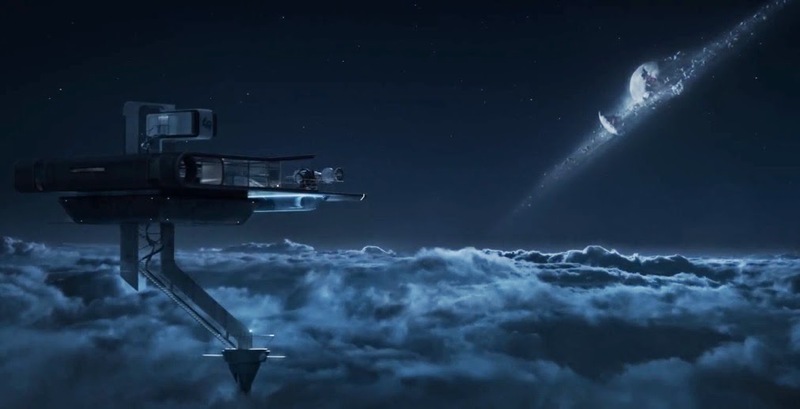 The movie Dark City had a flat earth consisting of a machine that could flood the whole plane-t. Shame the owners were dark beings harvesting humans souls huh? 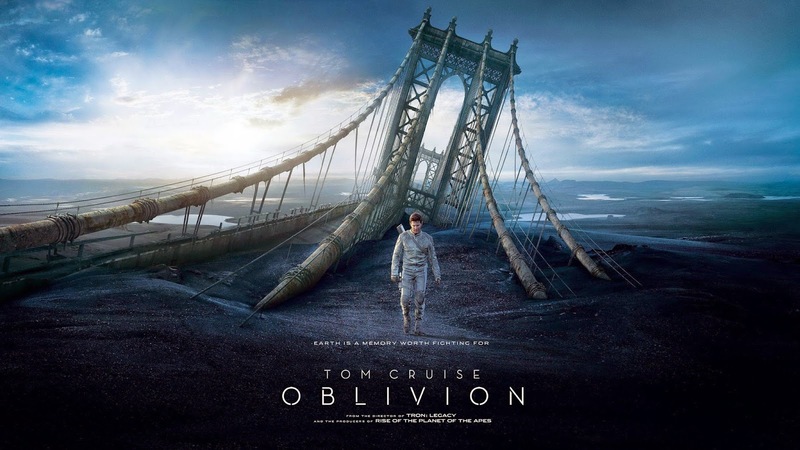 The movie Oblivion was a post apocalyptic story based around a destroyer that existed in the sky. A new movie comes out soon called Jupiter Ascending, possibly loaded with symbolism. If one simply types "Cataclysm" into google images, one would not expect to see lots of serpents and dragons wreaking havoc? This is what is returned (from a video game I've never played so we can rule out filtering). 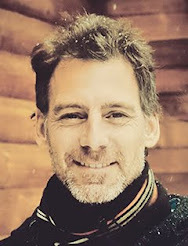 Recent climate change could be related (obviously not created by humans), the fast moving north pole could be related, the sun moving could be related, the chemtrails blocking out the sun could be related, my long going qabalistic dream puzzle possibly relating to 2020/2021 could also be related. Cataclysmicists (I made up a new word) forever say things will happen soon - two recent "supporting" videos are here, and here. Strangely enough, Sky News today led with a story about survival preppers. 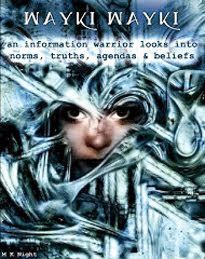 Maybe even 2012 was delayed by chemtrails and they want humanity controlled with chips before it comes? 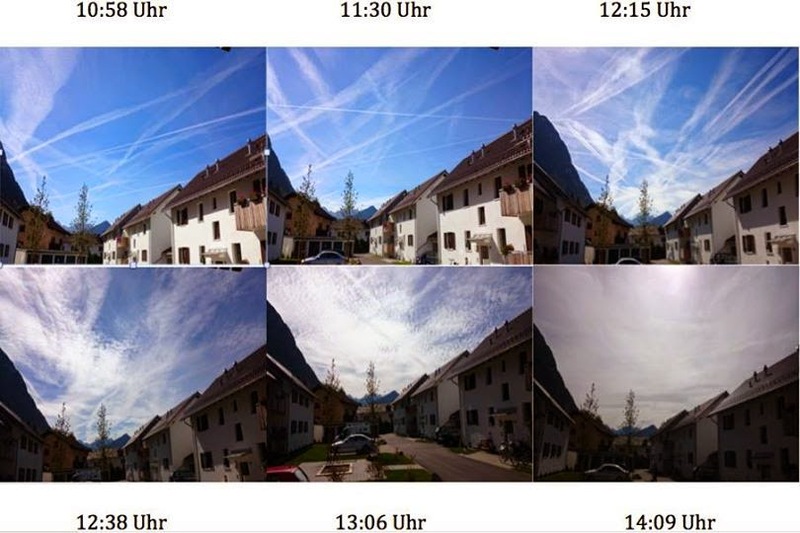 New Agers are so narcissistic they think the chemtrails are for them, nope, they are to block out the sun, wake up. They spray where the sun will be "in an hours time." Not everything is about you. But fear not, nobody's vessel gets out of here alive anyway, and the soul doesn't die.